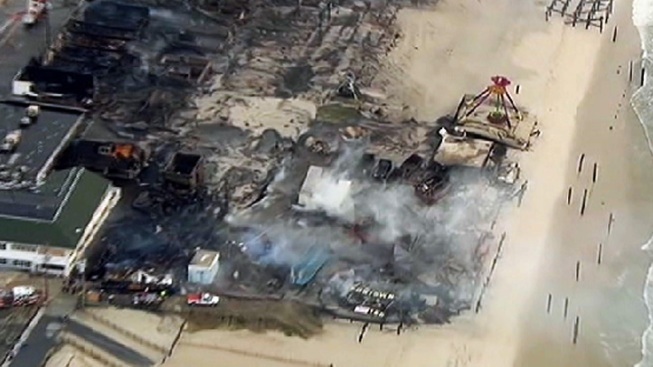 New Jersey will use Sandy-recovery money to pay for debris removal at the scene of last week's fire that ravaged a Jersey Shore boardwalk. Gov. Chris Christie's administration said it hopes the extra aid will speed the rebuilding. Dozens of businesses were destroyed in the blaze on a boardwalk that had only recently been repaired from damage it sustained in Sandy. "We're moving as swiftly and aggressively as we can to help these communities and their boardwalk businesses rebuild from this unfortunate stumbling block to our overall Sandy recovery," Christie said. Businesses are just starting to realize the staggering costs of rebuilding. Dan Shouger, the manager of Funtown Amusement Pier, estimates dozens of arcade games costing about $10,000 apiece were destroyed. "A lot of us don't have insurance, we don't have insurance on our contents in the building," he said. "We would be responsible to replace all of it." 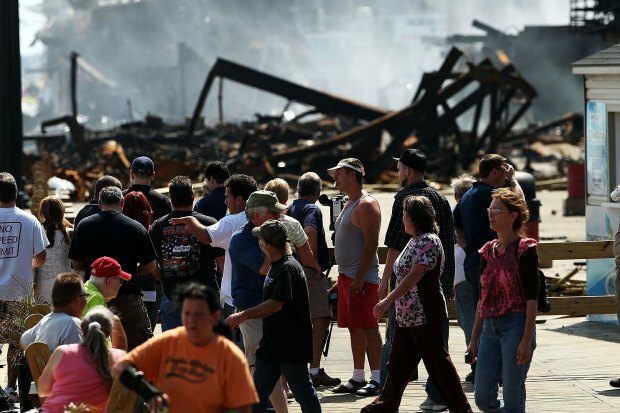 Funtown was ravaged in the fire, captured in one of the most harrowing images out of Seaside. Christie called the damage to some existing structures a safety hazard that needed to be addressed quickly. He said that covering the cost of debris removal would allow governments and businesses to "get down to work immediately to restore one of the Jersey Shore's most iconic boardwalks." Business owners are not being allowed to return to their stores until officials complete their investigation and deem it safe for people to return. The funding will be administered by the New Jersey Economic Development Authority through an existing Sandy block grant program. "The extensive damage caused by Thursday's fire has made the Seaside community's recovery from Superstorm Sandy all the more difficult," said Richard Constable, the state community affairs commissioner. He said his staff will work with local officials to determine which fire-damaged buildings are unsafe and need to be torn down. State officials and local relief organizations were on hand Monday afternoon to offer assistance to businesses and residents affected by Thursday's fire, which destroyed four blocks of boardwalk businesses. Representatives from the New Jersey Economic Development Authority and other agencies provided information at the Seaside Heights Municipal Complex. "They've lost their livelihoods, a lot of people who didn't expect to be unemployed are unemployed," said Patricia Donaghue of People's Pantry. "We have a long way to go," said roofer Paul Soucy. "We didn't even get caught up from Superstorm Sandy yet." Business owners were were not affected by the fire wanted to remind the public that Seaside is open for business -- and especially desperate for it now. "Three-quarters of the boardwalk is still open. Everybody's open for business. They need your support, come down and support them," said Clem Farulo of Steaks Unlimited. The Columbus Day Parade and Italian Festival in Seaside will go forward as planned. "Spend the weekend here. The hotels are open, they're not burned down," urged Michael Blandino, a Columbus Day Parade organizer. "Hopefully, we can have a very nice year." Jen Maxfield contributed to this report.